TheNextBigWriter has two different types of reviews - regular reviews and in-line reviews. What they are and when to use each of them is discussed below. These are the usual text style feedback that is seen across the Internet. In a regular review, the reader can provide comments that appear at the bottom of the content being reviewed. Regular reviews are a good way to provide general comments on the writing and they can easily be given from any device - desktop, mobile, tablet, etc. 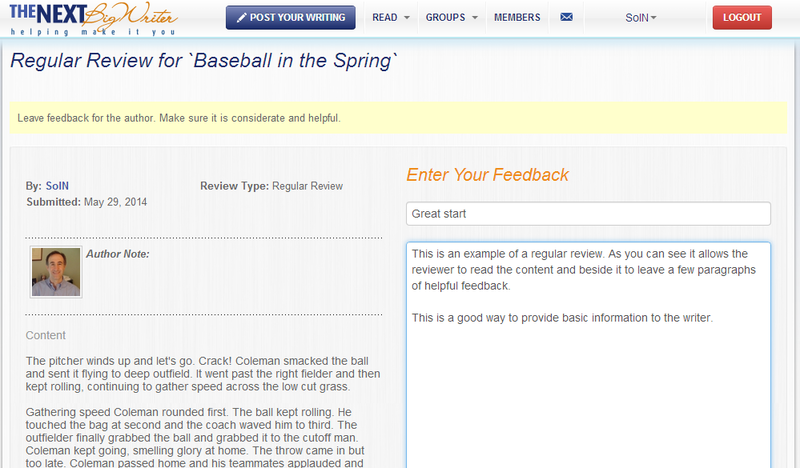 In-line reviews are a much more robust and sophisticated way to provide feedback on a piece of writing. The reviewer is able to comment within the body of the writing by highlighting a character, word, paragraph, or multiple paragraph and then leaving a comment related to the selection highlighted. This allows reviewers to more accurately point out issues with spelling, grammar, punctuation, sentence structure, character introduction, phrasing, and more. 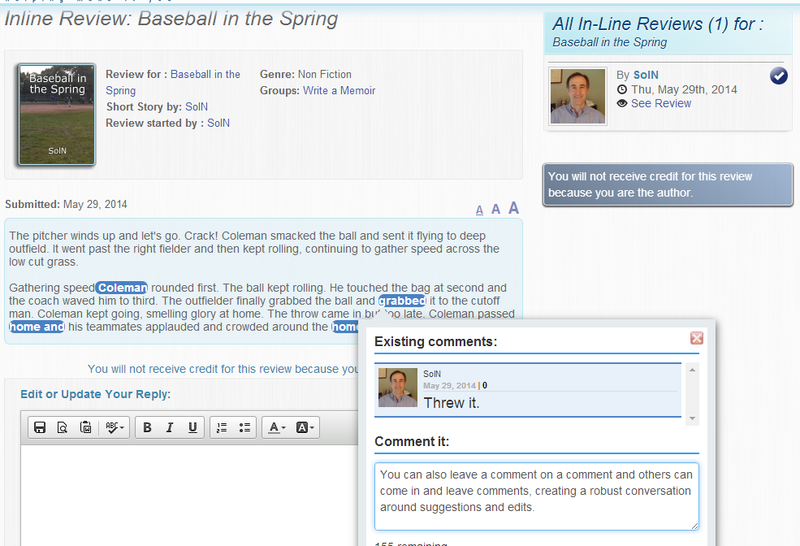 In addition, the in-line review process also allows the reviewer to leave a general comment at the bottom. As a result, they are a far superior way to leave and receive feedback on posted work. Desktop/laptop: Highlight the section you want to comment on using your mouse. This will trigger a comment box to pop-up. Leave your comment in the box. After you leave a comment, you can edit or add an additional comment by clicking on the highlighted text. You can read and leave comments on in-line reviews left by others by clicking the text that they have highlighted. Mobile device/Tablet: In-line reviews also work on iPhones, iPads, iPod Touches, Kindles, and other Android and Windows devices. To leave an in-line review using a touch screen, press down where you want to begin to highlight text. Then, use your finger to highlight what you want to comment on. Once you have done that, tap the screen near the highlighted section to prompt the comment box to appear. Leave your comment in the box and submit. Different devices might have slightly different methods for highlighting text. But if you play around for a few minutes, you will find the optimal way to highlight text and bring up the comment box. This page was created in 0.1220 seconds.